Currently there are 30 people on board the Oregon II. Eleven of us are on the science team, led by Brittany Palm our Field Party Chief. The majority of people on board are the NOAA Corps officers and Wage Mariners (engineers, deck hands, and stewards) who actually operate the ship. These men and women will spend 202 days at sea this year, bringing various teams of scientists out to conduct research from February to November. 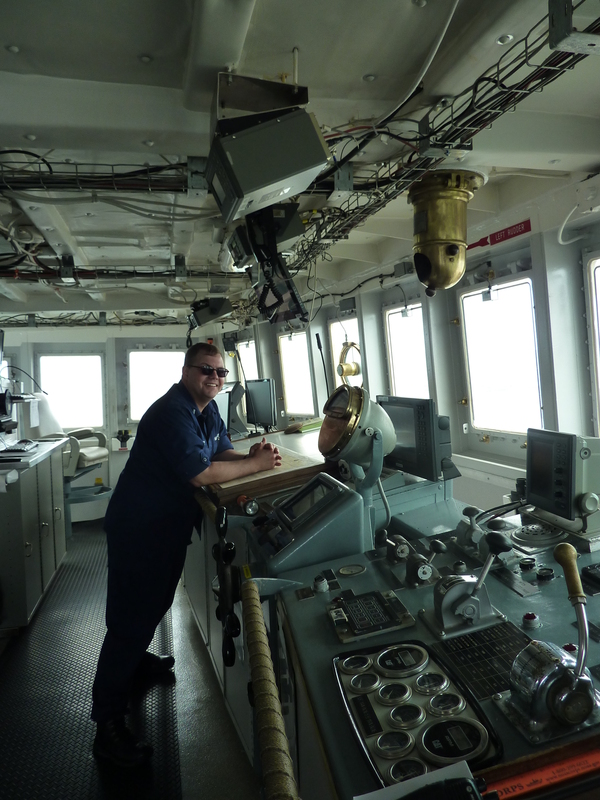 The Captain of the ship is Civilian Master Dave Nelson. He and the four NOAA Corps officers are responsible for navigating and controlling the ship, as well as coordinating operations on board. They work on the bridge which is on the upper level where the visibility is better.The bridge has at least 12 screens displaying different information, including our location in latitude and longitude, radar showing boats and rigs in the area, a bathymetry display showing water depth, video monitors of the decks, and a weather map. There is a paper copy of a nautical chart as well as an electronic version that looks a bit like a big brother of the GPS navigator you may have in your car. The team of engineers keeps the engines, generators and mechanical systems operating correctly. There is also a computer technician who keeps all the electronics up and running, including the navigation systems, the science equipment, and the internet connection. These jobs are essential, because keeping the ship running takes constant attention and you can’t just call in the repairman out here. 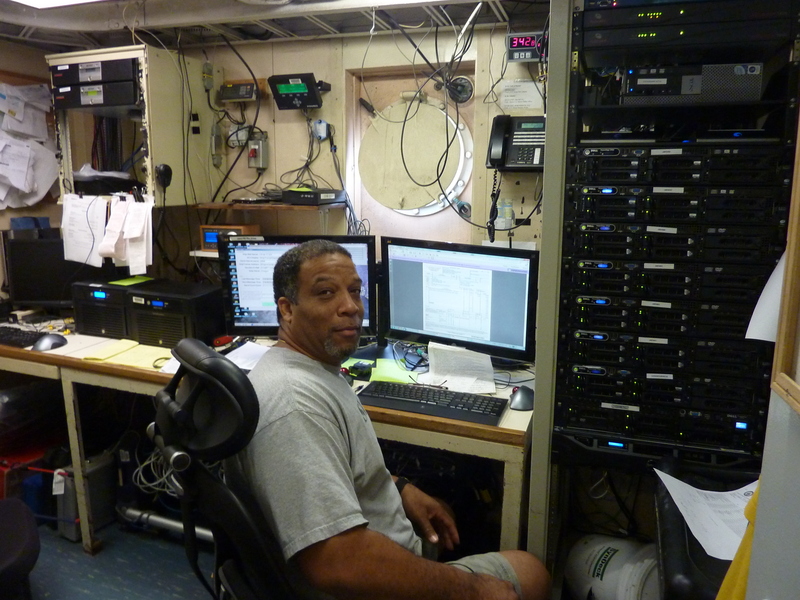 The deck department is responsible for running the heavy equipment that makes our research possible. 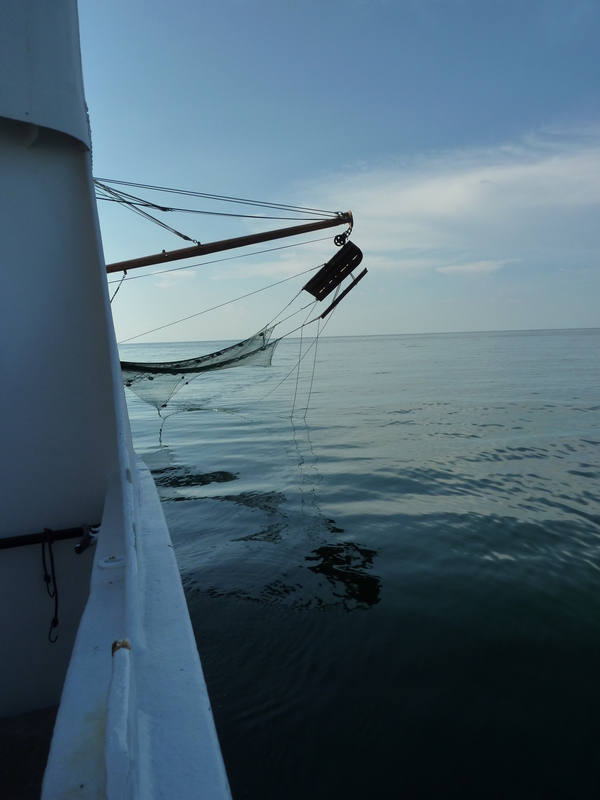 They operate the cranes and winches that lower the nets and scientific equipment into the water and lift them back out. They do regular maintenance of the boat and fishing gear. They also stand lookout in the bridge in reduced visibility at night or during stormy weather. Several students asked about safety on the boat in a series of “what if” questions. Safety is an important part of operations here, and there is a plan (and a backup plan) in place for each of your “what if” scenarios. Just like we do fire drills at school, we do safety drills here on the boat. One major difference is that if a fire were to break out on board, the crew would have to fight the fire themselves. We practiced putting on our survival suits that would keep us warm if we needed to abandon the ship. They are supposed to go on quickly over clothes, but take a minute to figure out the first time. Definitely not comfortable or fashionable, but I would want one if I ended up floating in the water for hours waiting to be rescued. I asked Captain Dave Nelson about what we would do in the event of a storm. With a length of 170 feet and a width of 34 feet, the Oregon II is large enough to handle normal summer storms like the one we sailed through today. But a tropical storm or hurricane is just too big to mess with. The officers keep a constant watch on the weather forecasts, and would steer us in to port if anything big was headed our way. I took a tour of the safety features of the Oregon II with the officer in charge of safety, Navigation Officer LTJG Brian Adornato to learn more about what would happen in case of an emergency. 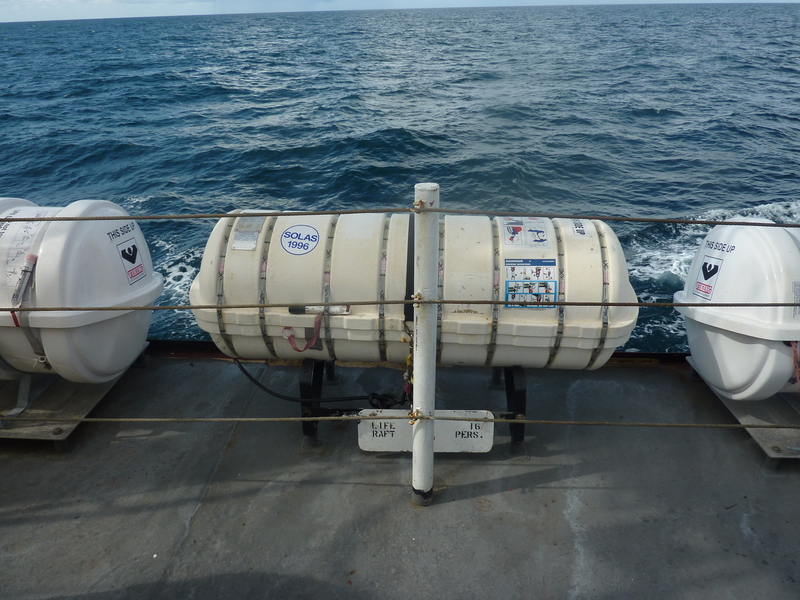 There are 6 life rafts on board and each can hold 16 people. (This sounds like the beginning of a math problem, doesn’t it?) There are 3 positioned on each side of the boat and they will automatically float free and inflate if that side of the boat goes under water. 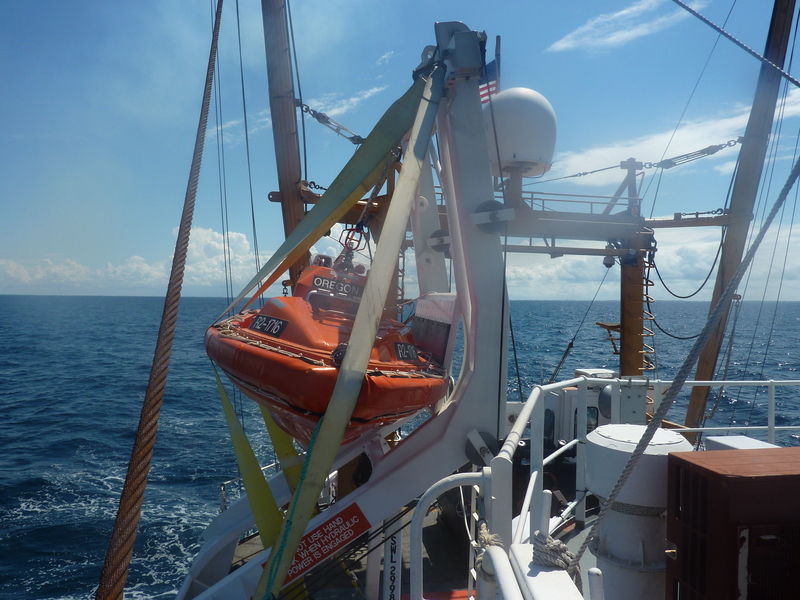 There is also an orange rescue boat which would be used if someone fell overboard. 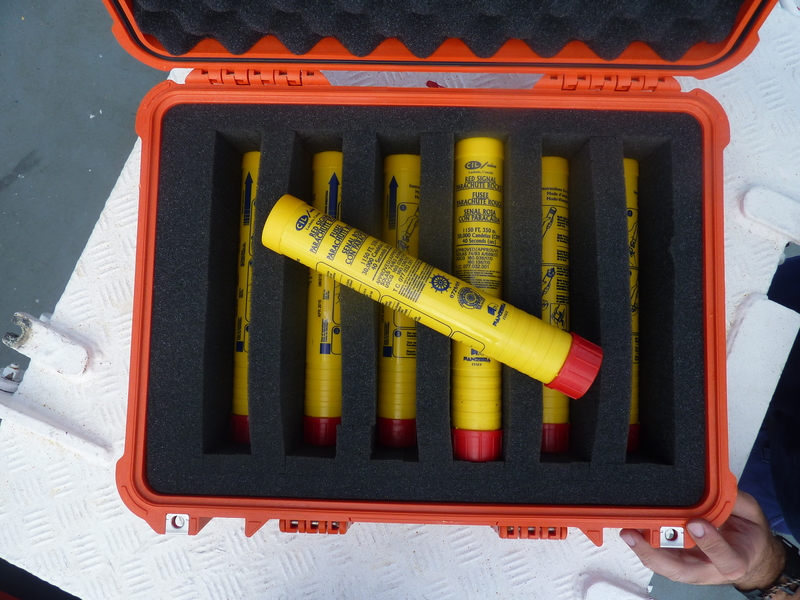 It is more regularly used when crew members SCUBA dive to perform ship maintenance. It there ever was an emergency on the ship, it would be essential to send out a call for help. First they would try the radio, but if that didn’t work we also have a satellite phone, Epirbs (satellite beacons), and a radar reflector (that lets ships nearby know there is an emergency). On the lower tech end of things there are emergency flares and parachute signals that would be launched into the air so other ships could locate us. We had wonderful weather for the first 9 days of the cruise with partly cloudy skies, gentle breezes and calm waters. I had gotten my “sea legs” and was used to walking and working on the constantly moving boat. Last night the weather turned and today we have been rocking and rolling through waves and rain. Now that the seas are rough I am unsteady on my feet again, staggering about and clutching onto railings. We can’t move as fast in stormy seas, so the time between stations has stretched out. 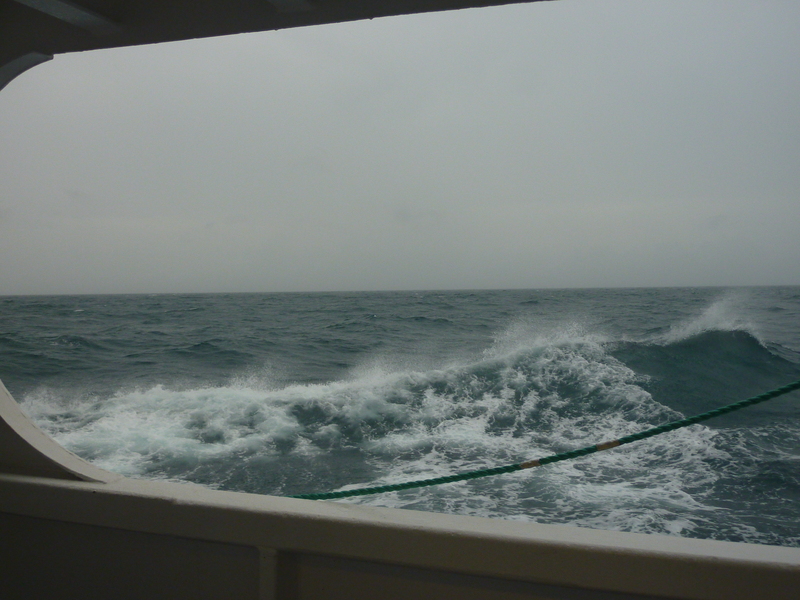 The weather was particularly bad this morning and it wasn’t safe to be out on deck operating the nets, so they had to skip a few stations. This weather is supposed to continue tomorrow, too. CDCPS science students – G0 ahead and do those math problems. How many total people can fit in the life rafts? How many life rafts would we need to fit everyone on board? Why do you think there are extra life rafts? Which job on board would you like to have? 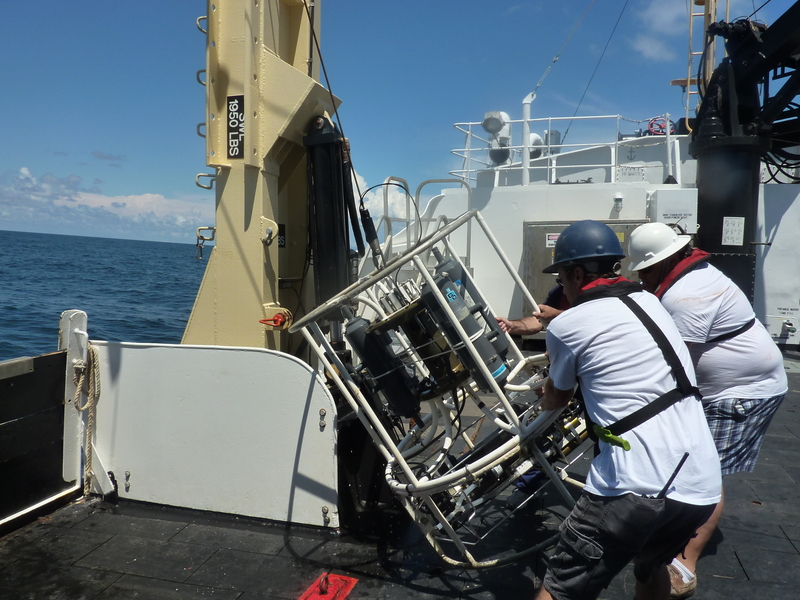 This entry was posted in 2013, NOAA Fisheries Service, NOAA Teacher at Sea, Sarah Boehm and tagged careers on board, Oregon II. Bookmark the permalink. There are 30 people on board. How many total people can fit in the life rafts? A total of 16 people can fit in a life raft. How many life rafts would we need to fit everyone on board? You will need 2 life rafts to fit everyone on board. Why do you think there are extra life rafts? I think there are extra life rafts because one may break down or someone can be left behind and needs a raft. I would like to have the job of being on the science team, because it sounds like a lot of fun. Taina – I like your thinking! You would be an excellent scientist. Do the survival suits come in kids sizes? Will you be able to bring one to school so we can try it on? I know the survival suits come in small and large sizes, so maybe there are kid sized ones, too. 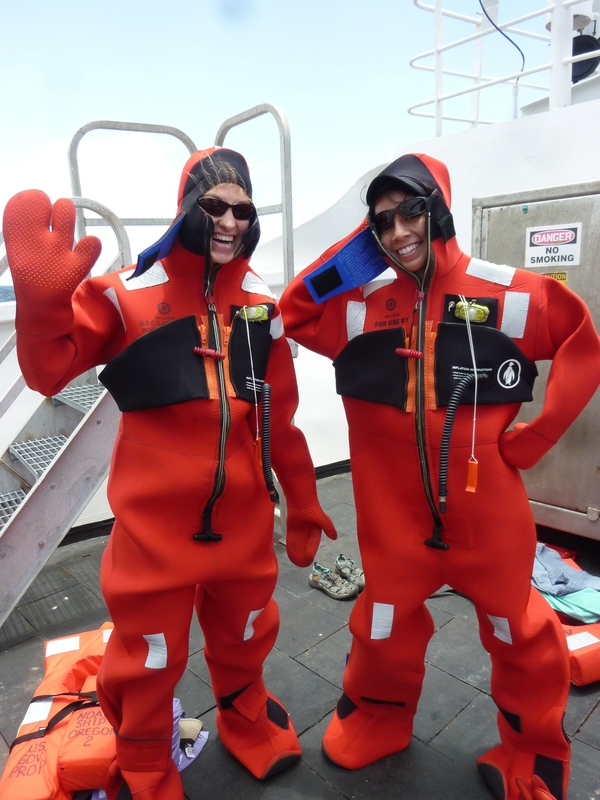 The survival suits stay on board for the next group, so I don’t have one to bring in to class.